For thirty years, the Metroid series has been one of Nintendo’s most beloved franchises. Many consider it to be one of the “Big Three” Nintendo properties, alongside Super Mario and The Legend of Zelda (in all fairness, Donkey Kong should probably be included as well and make it a “Big Four”). Like many of Nintendo’s ongoing series, Metroid got its start on the NES. Revisiting the original Metroid today comes with some good and bad. On the plus side, when playing Metroid today, it’s obvious to see how many of its elements continue to inspire game design even today. On the down side, many of the game’s elements have aged rather poorly, making it seem nearly obsolete in the face of its sequels. Metroid is a 2D action game, but unlike Nintendo’s platform-oriented Super Mario series, Metroid is far more open-ended. Samus, the protagonist bounty hunter, must traverse a single labyrinthian world on her quest to destroy the Metroids and the evil Mother Brain. Samus begins her quest with little more than the ability to jump and shoot lasers from her arm canon. Throughout the game, Samus can find items that give her additional abilities, like missiles, more powerful and longer-ranged lasers, the power to morph into a ball and plant bombs, extensions to her health, and others. 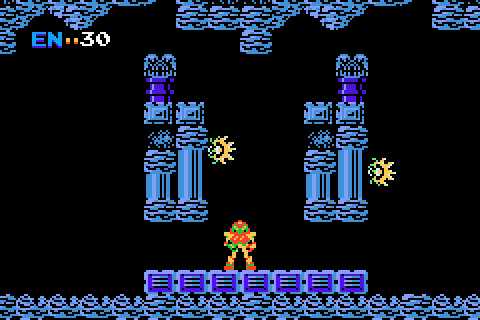 In one of the game’s great innovations, there are many areas that require specific abilities in order to be progressed, making Metroid a trailblazer in video game backtracking. Unfortunately, while Mario’s earliest entries remain timeless, the years have been wearing on Metroid in a number of ways. Perhaps the most prominent sign of the game’s prototypical nature is its lack of a map. Metroid is a game that is built around a labyrinth, and requires players to revisit areas, yet they are left to memory alone to remember where they’ve been and figure out where to go next. Considering that the game’s 8-bit limitations can make many areas look similar to one another, it can lead to many instances of accidental revisits. It can become downright confusing at times. Then there’s the difficulty. 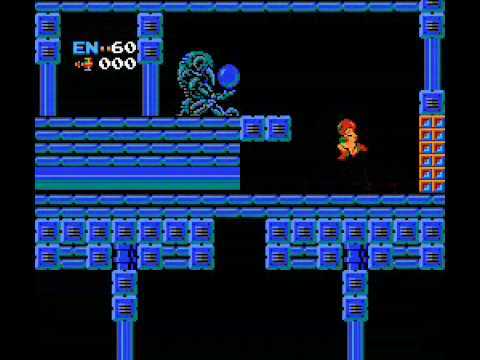 Samus begins the game with thirty hit points, which can initially be increased to ninety-nine by picking up health drops from enemies. Finding some of the aforementioned hidden items can grant additional sets of ninety-nine hit points, so Samus’ increasing health means there’s no need for extra lives. But before you think Samus is some kind of unstoppable tank, it needs to be said that many enemies can be hard to kill, do a notable amount of damage to Samus, and have hard to figure out patterns. Combine that with a number of moments where enemies flood the screen (slowing the action in the process), and you may think Samus is a lot more fragile than her amor may suggest. What’s worse is that, after every death, Samus’ health reverts back to thirty. There are certain ‘checkpoints’ if you continue playing right after dying, but if they’re next to a more difficult area, you may want to find a good spot to farm health drops before moving on, since it can be frustrating tackling these areas with so few hit points. The game has no save feature, instead opting for a password system. Thankfully, if you’re playing through the Wii U’s Virtual Console, the password system becomes entirely unnecessary, as you can end the game at any point and start back right where you left off. Metroid was also made famous for speed-running, with completing the game under certain time limits altering Samus’ action in the end. Take too long and she won’t even look at the player. Finish fast enough and she removes her helmet to reveal she’s a woman (her identity may be common knowledge now, but back in the day the reveal was revelatory). And if you manage to beat the entire adventure in an hour, Samus will go all-out and reveal her bikini body. Though considering she’s an 8-bit sprite here, her appearance is hardly reward enough for the hefty task. There’s certainly still a place in history for Metroid. Its ideas were ahead of its time, its heroine is one of the best in gaming, and the music – even in these 8-bit days – displayed how Nintendo games took video game soundtracks to the next level. But it would be a lie to say that the original Metroid holds up nearly as well as many other Nintendo classics. And if one were to compare it with its Super NES sequel, well, there is no comparison. Whether it’s Super Metroid’s perfecting of the series’ ideas, or Zero Mission’s re-imagining of this very adventure, Metroid’s own sequels have more or less turned the original into something of a relic. Yes, Metroid was a work of genius. But its genius shines much brighter in the games that succeeded it. Metroid is one of my go-to examples when pointing out that the first game might not be worth playing despite its incontestable importance to the series’ existence. There’s very little reason to do so outside of appreciating its historical significance. I found it annoying how every time you boot the game (in earlier versions), you start off with only 30 health, and the only way to refill it was by grinding enemies. As a contrast, in the original Zelda, you start off with only three hearts regardless of how many you have, but there were the fairy ponds which could completely restore them. Sure, you have to know where they are, but the important thing is that they’re there. A little design choice such as that is one of the reasons I don’t get the same feeling (or at least not to same extent) that the original Zelda was made completely obsolete by A Link to the Past (or other sequels). It helps that mechanically, the two games play differently enough to the point where they provide mostly disparate experiences. The original Zelda was arguably the first sandbox game and almost everything could be completed out of order while A Link to the Past has a bit more linearity (though it opens up a bit once you’ve completed Level 1 in the Dark World). Meanwhile, Super Metroid was basically a redo of the original, albeit a highly appreciated one that gave the creators the chance to implement their excellent ideas more effectively. Yeah, it is a game that has not aged very well, but its concept and structure make it a landmark. Metroid kickstarted one of Nintendo’s premiere franchises. But how does it stand the test of time after its sequels polished the formula?